Udupi, Nov 4, 2015: Speaking to media after inaugurating the new office of the JD(S) district unit at Udupi, former chief minister H D Kumaraswamy has alleged that both the Congress and the BJP are wasting time on frivolous issues, while there are hordes of serious problems troubling the nation. 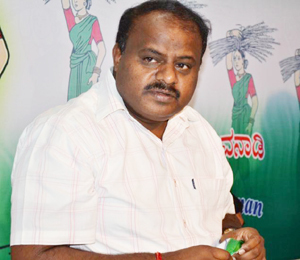 Kumaraswamy said that the parties were behaving in a irresponsible manner on all counts. Both are dealing with unnecessary issues like communalism and spending their time deciding the food rights of the people. They are also trying to woo different communities as part of their political gimmicks, he said and added that the daunting state of affairs in the country has made the people from outside to think twice before investing here. Prime Minister Modi’s invite, ’Come make in India’ will end up in ’Come die in India’," he criticised. He added that employment issues are looming large and the government should look for solutions at the earliest. The unemployed youths are moving away from right path and indulging in anti-social activities, he rued. The JD(S) leader said that he does not have any hopes of the State getting better governance in the aftermath of the Cabinet expansion. The process has finally ended as the speculations of induction and expulsion in the State cabinet were the matter of suspense in the past 18 months. Coming down heavily on the State government for its inefficiency in tackling the increasing cases of farmer suicide, Kumaraswamy said that nearly 80 per cent of the cases are in the rejected list with regard to compensation for the farmers. Out of 36 cases in Chikkamagaluru, 25 applications are rejected, while in Raichur, out of 47 cases, only eight have been considered. He added the scenario is practically the same in other districts. He, however, promised that the JD(S) would give Rs 50,000 to the victims’ families and that, if the families were in very bad situation, the compensation amount would be increased. Kumaraswamy asserted that the JD(S) will contest for all the seats in the forthcoming town panchayat and zilla panchayat polls. He, however, did not rule out the possibility of joining hands with other parties in the aftermath of the polls. He said the party will contest for all the seats in 30 districts. He said he would prefer strengthening the party in the coastal belt by infusing youth force into the party. The party needs a boost that will help us counter the communal agenda of both Congress and BJP, he asserted. He added that the political scenario in the coastal belt has been maligned by the communalism, as both the parties were playing with the religious sentiments of Hindus and Muslims, rather than concentrating on local issues.